Just over a year ago, I wrote "The Fantastic Four That Make FANG Look Tame," highlighting four stocks in the Dow Jones Industrial Average that had dramatically outperformed some of the most popular growth names in the market and had soared to their highest valuations in history in the process. To me, this clearly suggested that the euphoria towards owning stocks was not confined to a select group of tech stars. It was far broader than that. But there's a better way of making this point. 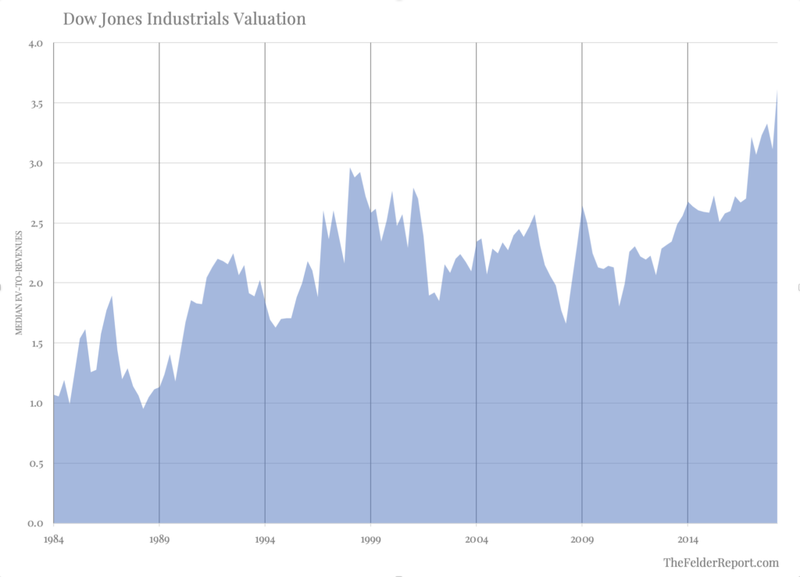 And that is to simply note that the median valuation of all the stocks currently among the Dow Industrials has recently soared to a record high. In fact, it's now more than 20% higher than it was at the peak of the dotcom mania. Median valuations in other indexes show the same result. Just over a year ago, I wrote "The Fantastic Four That Make FANG Look Tame," highlighting four stocks in the Dow Jones Industrial Average that had dramatically outperformed some of the most popular growth names in the market and had soared to their highest valuations in history in the process. To me, this clearly suggested that the euphoria towards owning stocks was not confined to a select group of tech stars. It was far broader than that. But there's a better way of making this point. And that is to simply note that the median valuation of all the stocks currently among the Dow Industrials has recently soared to a record high. In fact, it's now more than 20% higher than it was at the peak of the dotcom mania. Thus, it's not only these four stocks I wrote about a year ago, in addition to a handful of tech stars, that are the object of investor euphoria today. It's the entire index. Median valuations in other indexes show the same result. The valuation extremes we are witnessing today are more pervasive than anything we have seen before. And it's clearly the result of the greatest volume of price-insensitive buying we have ever seen before, namely stock buybacks and the widespread adoption of passive investing. At some point, however, price-insensitive buying will become price-insensitive selling. It always does.